Abstract: Publication date: 1 August 2019Source: Agriculture, Ecosystems & Environment, Volume 280Author(s): A. Angelidis, L. Crompton, T. Misselbrook, T. Yan, C.K. Reynolds, S. Stergiadis Beef cattle production is valuable to food security, contributing meat of high nutritional value. However, beef cattle are rather inefficient in utilising dietary nitrogen (N), thus excreting substantial amounts of N in their urine and faeces and imposing an environmental burden. The aim of this study was to evaluate the main dietary factors affecting N use efficiency (NUE) in beef cattle and develop prediction models for N excretion in manure, faeces and urine. This knowledge is essential for the development and evaluation of cost-effective N mitigation strategies. A database of 289 treatment means was constructed from 69 published studies and 1194 animals. Data included diet contents of N, dry matter (DM), organic matter (OM), neutral-detergent fibre (NDF), acid-detergent fibre (ADF), ether extract, starch, ash, gross energy (GE), metabolisable energy (ME), and outputs of N in manure (MNO), in urine (UNO) or in faeces (FNO). Regression equations to predict MNO, UNO and FNO, as well as various NUE indicators, were developed using residual maximum likelihood analysis. Evaluation of new and existing models was performed using the mean prediction error (MPE) to describe prediction accuracy. MNO, UNO and FNO were predicted with improved accuracy (MPE from 0.557 to 0.162; from 0.764 to 0.208; and from 0.458 to 0.177, respectively) when DM or OM digestibilities, and/or diet contents of N, NDF, ADF, Starch, OM, GE, ME, and/or forage proportion in the diet were added as predictors in different equations already containing either DM intake, N intake or body weight as primary predictor. New and existing models displayed an under-prediction of N outputs at the highest range of actual N outputs (when MNO > 207 g/d, UNO > 109 g/d). However, some of the new equations had improved overall accuracy (best MPE for MNO, UNO and FNO being 0.162, 0.208 and 0.177, respectively) and, when DM digestibility, and contents of N, NDF, Starch and ME were added as predictors in different equations, the extent of this under-prediction was also reduced (occurring when MNO > 208 g/d, UNO > 132 g/d). The regression models for NUE, demonstrated that diets which are more digestible and contain less N and fibre and more ME, may reduce N excretions, but mitigation strategies will also need to account for the potential effect on animal productivity and health. Abstract: Publication date: 1 July 2019Source: Agriculture, Ecosystems & Environment, Volume 279Author(s): Yudan Xu, Shikui Dong, Xiaoxia Gao, Mingyue Yang, Shuai Li, Hao Shen, Jiannan Xiao, Yuhui Han, Jing Zhang, Yu Li, Yangliu Zhi, Yunfeng Yang, Shiliang Liu, Quanming Dong, Huakun Zhou, Paul Stufkens A great number of ecological conservation and restoration projects have been implemented to prevent the deterioration of alpine grasslands on the Qinghai-Tibetan Plateau. However, few researches have documented the effects of ecological projects on the improvement of ecosystem services of alpine grasslands based on field investigations. In this study, 24 plots of alpine meadow along different succession times were investigated to estimate the impacts of ecological restoration on four key ecosystem services (i.e., soil organic carbon sequestration (SOCS), soil total nitrogen sequestration (STNS), biodiversity, and aboveground biomass) in the Glog Tibetan Autonomous Prefecture of Qinghai Province, China. The results showed that STNS and biodiversity of degraded alpine meadows were significantly improved through restoration actions, while SOCS and aboveground biomass didn’t change. The relationships of above- and belowground ecosystem services changed over restoration time. Trade-offs between aboveground biomass and biodiversity, between aboveground biomass and SOCS at stage Ⅲ were significantly improved, in contrast to those at stage Ⅰ. Trade-off between STNS and biodiversity at stage Ⅱ was significantly increased, in contrast to those at stage Ⅰ. Economic profit of ecological restoration was insignificantly changed along restoration time. Our results suggested that human-induced restoration was a feasible approach to improve the ecological and economical values of “Black Beach” on the Qinghai-Tibetan Plateau, and further restoration actions and long-term research are required to enhance the ecosystem services of revegetated degraded meadow. Abstract: Publication date: 1 July 2019Source: Agriculture, Ecosystems & Environment, Volume 279Author(s): Rachel Bezner Kerr, Joseph Kangmennaang, Laifolo Dakishoni, Hanson Nyantakyi-Frimpong, Esther Lupafya, Lizzie Shumba, Rodgers Msachi, Godfred Odei Boateng, Sieglinde S. Snapp, Annita Chitaya, Esther Maona, Tinkani Gondwe, Paul Nkhonjera, Isaac Luginaah This study examines whether agroecological farming practices, when employed by highly vulnerable households in sub-Saharan Africa, can improve food security and dietary diversity. The research involved a four-year study with 425 smallholder households, selected purposively based on high levels of food insecurity and/or positive HIV status. The households carried out agroecological experiments of their own choosing over a four-year period. Baseline (n = 306) and follow-up (n = 352) surveys were conducted in 2011 and 2013 respectively to assess changes in farming practices, food security, crop diversity and dietary diversity. Longitudinal mixed effects models were used with 203 matched households to estimate determinants of change in food security and dietary diversity at the population level. Qualitative interviews and focus groups were also conducted to provide depth to the survey findings. The findings show that participatory agroecology experimentation increased intercropping, legume diversification and the addition of compost, manure and crop residue amendments to the soil. Intercropping was associated with food security and the use of organic soil amendments was associated with gains in dietary diversity in bivariate analysis. Household food security and dietary diversity increased significantly over a 2-year period. Importantly, multivariate models showed that spousal discussion about farming was strongly associated with increased household food security and dietary diversity. Households who discussed farming with their spouse were 2.4 times more likely to be food secure and have diverse diets. Addition of compost or manure to the soil significantly influenced dietary diversity. These findings indicate that poor, vulnerable farmers can use agroecological methods to effectively improve food and nutritional security in sub-Saharan Africa. The study also highlights how linking agroecology to participatory research approaches that promote farmer experimentation and gender equity also lead to greater health and well-being. The study sheds light on how agroecological approaches can rapidly improve food security and dietary diversity, even under conditions of acute social, health or ecological stress. It draws attention to issues of equity and farmer-led approaches in addressing food security and nutrition. Abstract: Publication date: 1 July 2019Source: Agriculture, Ecosystems & Environment, Volume 279Author(s): Zhenbiao Jiao, Coline C. Jaworski, Yanhui Lu, Lefu Ye, Kongming Wu, Nicolas Desneux Agricultural landscapes are fast-changing systems due to crop planting and harvesting. These events strongly influence movements of arthropod pests and their natural enemies, yet they are insufficiently considered to implement informed pest management strategies. In China, the adoption of Bt-cotton crops at very large scales has given rise to the recent pest status of mirid bugs such as Apolygus lucorum in cotton fields. In this study we relied on carbon 13 stable isotope analysis to estimate the dispersal of A. lucorum in the Bt-cotton agricultural landscape, composed of a mosaic of cotton and maize and other minor crops. We showed that a diet on C3-plants including cotton induced a significantly different signature than the C4-plant maize. Based on δ13C ratios, we showed that more than 75% of mirid bugs caught in maize fields did not originate in situ, since they had a C3-diet and therefore most likely dispersed from neighbouring cotton fields. Conversely, less than 10% of mirid bugs in cotton fields had a diet on C4-plants, so the vast majority of them did not disperse from maize fields but instead likely stayed in cotton fields. We also observed a delayed establishment of A. lucorum populations in maize fields compared to cotton fields, likely due to host phenology. Indeed we showed in laboratory that juveniles’ survival rate and adults’ fecundity are high on maize silk and grain only, whose resources are available in the field shortly before harvest. 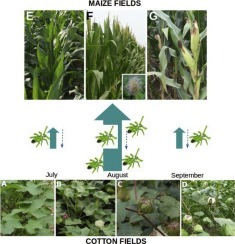 Unidirectional movements of mirids from cotton to maize associated with poor developmental success on maize highlight the high potential of maize fields to act as a sink for A. lucorum mirid bug pests. This could be wisely implemented in IPM programs to enhance the management of mirid bug population outbreaks in cotton fields and reduce yield loss on cotton.Graphical abstractDispersal of A. lucorum adult mirid bugs revealed by carbon 13 stable isotope analysis, in Chinese Bt-cotton agro-landscapes, during the growing season of maize and cotton. Important fluxes of mirid bugs are measured from C3 host plants (thus, most likely cotton, the biggest reservoir of mirid bugs in the environment) to maize fields (maize in the only C4 plant in the environment) as shown by large, green arrows but reciprocal fluxes are not observed (small dashed, blue arrows). Therefore, maize fields have a potential to act as a sink for outbreaking mirid bug pests from source cotton fields. A, E: vegetative growth of cotton and maize, respectively; B, F: flowering stages of cotton and maize, respectively; C–D, F: fruiting stages of cotton and maize, respectively. Abstract: Publication date: 1 July 2019Source: Agriculture, Ecosystems & Environment, Volume 279Author(s): Ben Li, Wei Zhang, Tianhou Wang, Lichen Zhou Amphibians are threatened by the intensification of agriculture throughout the world. Several studies have considered the morphology of animals to be an indicator of the health of a population, but differences in anuran morphology (especially body condition) in different breeding habitats in agricultural landscapes remain largely unknown. In this study, we investigated differences in the abundance and morphology of the rice frog (Fejervarya multistriata) in three waterbody types (ten farmland irrigation ditches, ten fruit forest drainage ditches, and ten lotus ponds) in agricultural landscapes in Shanghai, China. We sampled the snout–vent length, body mass, and body condition index for 206 individual rice frogs from the three types of waterbody. Our results showed that the abundance of rice frogs was higher in farmland irrigation ditches than in the other two habitats, whereas the snout–vent length, body mass, and body condition index of rice frogs were lower in farmland irrigation ditches than in the other two habitats. Our results suggest that breeding habitats in agricultural landscapes have different effects on rice frog abundance and morphology, and that constructing diverse waterbodies (other than farmland irrigation ditches) in the same agricultural landscape might benefit the condition of rice frogs. Abstract: Publication date: 1 July 2019Source: Agriculture, Ecosystems & Environment, Volume 279Author(s): Yodit Kebede, Felix J.J.A. Bianchi, Frédéric Baudron, Pablo Tittonell Lepidopteran stemborers are a serious pest of maize in Africa. While farmers have adopted cultural control practices at the field scale, it is not clear how these practices affect stemborer infestation levels and how their efficacy is influenced by landscape context. The aim of this 3-year study was to assess the effect of field and landscape factors on maize stemborer infestation levels and maize productivity. Maize infestation levels, yield and biomass production were assessed in 33 farmer fields managed according to local practices. When considering field level factors only, plant density was positively related to stemborer infestation level. During high infestation events, length of tunnelling was positively associated with planting date and negatively with the botanical diversity of hedges. However, the proportion of maize crop in the surrounding landscape was strongly and positively associated with length of tunnelling at 100, 500, 1000 and 1500 m radius, and overrode field level management factors when considered together. Maize grain yield was positively associated with plant density and soil phosphorus content, and not negatively associated with the length of tunnelling. Our findings highlight the need to consider a landscape approach for stemborer pest management, but also indicate that maize is tolerant to low and medium infestation levels of stemborers. Abstract: Publication date: 1 July 2019Source: Agriculture, Ecosystems & Environment, Volume 279Author(s): Xuezhang Li, Xianli Xu, Wen Liu, Liang He, Chaohao Xu, Rongfei Zhang, Le Chen, Kelin Wang Temporal soil water content (SWC) patterns are affected by meteorological factors that operate at different intensities at different scales. Pearson’s correlation analysis can only identify linear correlations at the measurement scale, therefore we examined the relationships between SWC and meteorological factors at different scales and occasions in a karst landscape using wavelet coherency analysis. SWC was measured at five soil depths using time domain reflectometry in two land uses over 242 d in a karst depression, southwest China. The results showed that the temporal SWC dynamics were influenced mainly by precipitation and land use. The temporal SWC patterns in farmland differed from those in grassland. The relationships between SWC and meteorological factors varied with scale, and a significant correlation was generally observed at large scales. Information on variation of scale for SWC improved the performance of soil moisture prediction. Soil depth had a greater impact on wavelet coherency at large scales than land use. Positive and negative correlations were detected between SWC and meteorological factors using wavelet coherency analysis. This study indicated that wavelet coherency analysis has potential to reveal the scale-specific dependence of SWC on controls. Abstract: Publication date: 1 July 2019Source: Agriculture, Ecosystems & Environment, Volume 279Author(s): Randall D. Jackson, Brittany Isidore, Richard L. Cates Organic livestock production in the U.S. requires that a significant amount of feed comes from grazed pasture. While principles of grazing management for temperate grasslands are well known, organic livestock production may result in unique plant-soil dynamics with ramifications for farmer decision-making and management. We reviewed the literature for direct or indirect evidence that organic pasture management results in altered plant-soil dynamics and assessed whether organic management might necessitate modifications or additions to managed grazing principles. The literature directly addressing these questions is sparse. We found some evidence that organic management can stimulate soil biota but no evidence for grassland yield, soil stocks, or soil transformation rate differences between organic and non-organic pastures. Given the constraint on fertilizer and herbicide inputs in organic management, established principles of managed grazing – rotating livestock frequently through paddocks such that plants are uniformly grazed but left with significant residual biomass and time for regrowth – are critical for maintaining dense, productive swards in organic pasture management. Abstract: Publication date: 1 July 2019Source: Agriculture, Ecosystems & Environment, Volume 279Author(s): Agustín M. Bartual, Louis Sutter, Gionata Bocci, Anna-Camilla Moonen, James Cresswell, Martin Entling, Brice Giffard, Katja Jacot, Philippe Jeanneret, John Holland, Sonja Pfister, Orsolya Pintér, Eve Veromann, Karin Winkler, Matthias Albrecht Semi-natural habitats (SNH) are vital to sustain pollinators and natural enemies, and the ecosystem services they provide in agroecosystems. However, little is known about the relative importance of different SNH types and their vegetation traits for pollinators and natural enemies. Yet, such knowledge is essential for effective habitat management to promote both functional arthropod groups and associated multiple ecosystem services. We quantified vegetation traits and abundances of pollinators (bees) and natural enemies (predatory flies and parasitic wasps) in 217 SNH differing in type (woody or herbaceous) and shape (linear or areal habitats), for edge and interior locations within each SNH patch with respect to adjacent crops, across 62 agricultural landscapes in four European countries. Pollinators and natural enemies responded distinctively to major SNH types and within-habitat location of SNH: abundance of natural enemies (predatory flies and parasitic wasps) was higher along woody habitat edges than herbaceous SNH or the interior of woody habitats. In contrast, bee abundances, especially of honey bees, were generally higher in areal herbaceous compared to woody SNH. Abundances of both wild bees and managed honey bees were lowest for the interior sampling location in areal woody habitats. These findings reflected divergent key vegetation traits driving pollinator and natural enemy abundances across SNH: bee pollinators increased with herbaceous plant cover and were well predicted by SNH type and the floral abundance of identified key plant trait groups. In contrast, floral abundances of these plant groups were poor predictors of the studied natural enemies, which were better predicted by SNH type and sampling location within SNH. Our findings stress the need to move beyond the simplistic pooling of SNH types and highlight the importance of considering their vegetation traits to more reliably predict pollinators and natural enemies in agroecosystems. They suggest that the floral abundance of key groups of flowering plants is crucial for habitat management to promote bee pollinators, while vegetation-structural traits appear more important for predatory flies and parasitoids. The distinct importance of different SNH types and associated vegetation traits for pollinators and natural enemies calls for agroecosystem management ensuring diverse SNH with complementary vegetation traits to concomitantly foster pollination and pest control services. Abstract: Publication date: 1 July 2019Source: Agriculture, Ecosystems & Environment, Volume 279Author(s): A. Gorosábel, J. Pedrana, L. Bernad, V.J. Caballero, S.D. Muñoz, N.O. Maceira Conflicts between waterfowl and agriculture are common in many nations around the world. However, these birds can also provide a variety of benefits that humanity can obtain from nature. There are three migratory and endemic sheldgeese (Ruddy-headed Goose Chloephaga rubidiceps, Ashy-headed Goose Chloephaga poliocephala and Upland Goose Chloephaga picta) which are species of conservation concern in Argentina. Sheldgeese are in constant conflict with the agricultural practices in the Pampas region of Argentina. The objective was to measure possible damages and benefits due to geese grazing on winter wheat crops during different growth stages, in the southeast of Buenos Aires province, Argentina. We established a stratified random plot design in nine fields, where we placed geese exclosure plots and plots without exclosure, allowing sheldgeese to graze. From May to September, we visited each field every two weeks. We performed transects where we counted and collected feces in order to estimate the grazing intensity. We analyzed the total concentration of Nitrogen (N) and Phosphorus (P) in the feces in the period before and after the wheat emergence. We also performed microhistogical analysis to evaluate sheldgeese diet in these two periods. During the crop growth and at harvest, we evaluated possible damages (wheat cover, percentage of eaten plants, percentage of eaten tillers, chlorophyll content, grain yield per plot, harvest index, weight of 1000 grains) and benefits (number of tillers per plant, percentage of weed cover, protein content) of geese grazing. We found that sheldgeese grazing varied along the different visits and among the experimental fields. Geese grazing negatively affected the wheat cover but there was no effect on the final yield. The input of nutrients provided by sheldgeese feces was higher in the period after the crop emergence, when they only ate wheat. Results on the birds’ diet showed that they fed on weeds before wheat emergence thus providing an ecosystem service. In this study, we found elements that could help to shed light on the real impact of sheldgeese in crops and discovered some benefits that these birds could be providing to crops in the Pampas ecoregion. Abstract: Publication date: 1 July 2019Source: Agriculture, Ecosystems & Environment, Volume 279Author(s): X. Huang, N.F. Fang, Z.H. Shi, T.X. Zhu, L. Wang Hydrological characteristics are expected to be affected by climate variability and vegetation dynamics which are interconnected and coupled in most cases. Few studies have decoupled the effects of vegetation dynamics and climate variability on hydrological characteristics, a process that benefit both water resources management and agricultural water allocation. In this study, we used partial least squares-structural equation modeling (PLS-SEM) to decouple the effects of climate variability and vegetation on the temporal variations in hydrological characteristics on a monthly scale in the Upper Du watershed (8973 km2) in subtropical China. Monthly hydrometeorological and vegetation cover data were collected from 2000 to 2010. Moderate Resolution Imaging Spectroradiometer (MODIS) derived vegetation indices were used to represent the vegetation status of the watershed. The results showed that vegetation dynamics and climate variability account for up to 67% of the temporal variation in runoff, whereas the combined effects of vegetation, climate and runoff explain 62% of the variation in sediment. Climate variability both directly affects monthly hydrological characteristics and indirectly affects these characteristics through its effects on vegetation. Vegetation is negatively correlated with both runoff and sediment, and the net effect of vegetation on the sediment load (total effect = −0.20) is greater than its effect on runoff (total effect = −0.12). Our results indicate that the direct effect of vegetation on sediment (direct effect = −0.09) is smaller than the indirect effect (indirect effect = −0.11) of vegetation on sediment through its influence on runoff; thus, vegetation reduces both the sediment concentration and the sediment load mainly by reducing runoff. Compared to conventional multivariate statistical methodologies, PLS-SEM provides additional valuable information, including the direct and indirect impacts of climatic factors and vegetation on hydrological characteristics. Abstract: Publication date: 1 July 2019Source: Agriculture, Ecosystems & Environment, Volume 279Author(s): Xianhui Zhou, Wenjuan Wu, Kechang Niu, Guozhen Du With rapid changes in climate conditions and grazing regimes, a decline in soil quality has become a main challenge for sustainability of Tibetan rangeland. Increasing evidence highlights the significance of plant biomass, but few studies test the role of realistic loss of plant diversity in impacting soil quality. We hypothesized that loss of species diversity will decrease soil quality, not only through lost standing biomass (i.e., “mass effect”) but also directly via the loss of the “diversity effect”. Considering the realistic loss of species diversity following overgrazing, grazing exclusion and climate change, we experimentally removed grass, sedge and various forb species from a Tibetan alpine meadow to test this hypothesis. After target plant species had been removed for five years, we examined the effect of the species removal on the plant community and soil quality with Bayesian linear mixed effect models and inferred potentially causal linkages between plants and soil with a Bayesian network. Results showed (i) overall, plant species removal not only significantly decreased plant diversity and standing biomass but also decreased soil organic matter and nutrients; (ii) the standing biomass decreased more pronouncedly in response to the removal of sedge and grass species, but plant diversity and soil nutrients decreased more pronouncedly in response to the removal of various forb species; and (iii) the loss of species diversity rather than standing biomass was directly associated with the decline in the soil quality, especially a decrease in soil available P. In short, our results indicate that realistic loss of plant species diversity can decrease soil quality in a Tibetan alpine meadow through lost the “diversity effect”. The functional significance of plant species diversity in maintaining soil quality supports the expectation of local pastoralists that diverse plants, promoted by traditionally rotational grazing, can ensure the sustainability of alpine soil and Tibetan rangeland. Abstract: Publication date: Available online 5 April 2019Source: Agriculture, Ecosystems & EnvironmentAuthor(s): Amparo Lázaro, David Alomar High pollinator reliability is essential to maintain a stable and predictable crop production. However, still few studies have considered landscape effects on the stability (low variability) of the pollination service to crops. The stability of pollination services may increase in heterogeneous landscapes with high availability and diversity of alternative habitats. By using data on pollinator visitation and fruit production in 18 almond tree fields in Mallorca Island, we related landscape heterogeneity (richness, evenness and diversity of land-cover classes) at 1 and 2 km-radius buffer zone to the spatial (among-tree) stability of their pollination services (total visit rates, wild pollinators’ visit rates, pollinator richness and fruit set). Overall, landscape heterogeneity increased the spatial stability (i.e., decreased spatial variability) of pollination services to almond trees. Interestingly different components of heterogeneity influenced diverse components of this service. Thus, increasing landscape evenness at the 2 km buffer zone increased the spatial stability of both total pollinator visitation and fruit set. However, the stability of wild-pollinators’ visit rate as well as the stability of pollinator richness increased instead with the percentage of natural habitat in the buffers, as the abundance of wild pollinators might depend on the total availability of habitat in the field surroundings. The stability in pollinator richness had a further positive effect on the stability of fruit set, indicating the importance of diversity maintaining stable crop production. Lastly, fruit set was also negatively affected by landscape richness, probably because of a loss of pollinator source habitat when the number of land uses is too high. Preserving a heterogeneous habitat of high quality in the surroundings of crop fields may help to maintain a stable fruit production. Abstract: Publication date: Available online 2 February 2019Source: Agriculture, Ecosystems & EnvironmentAuthor(s): Xiaoxia Gao, Shikui Dong, Yudan Xu, Shengnan Wu, Xiaohui Wu, Xi Zhang, Yangliu Zhi, Shuai Li, Shiliang Liu, Yu Li, Zhanhuan Shang, Quanmin Dong, Huakun Zhou, Paul Stufkens Resilience is crucial to promote the ecosystem sustainability and maintain ecosystem functions and services. Clarifying the variation regularity of the resilience can provide a theory foundation for the restoration and management of degraded ecosystems. Grassland cultivation has been largely used to restore extensively distributed “Black Beach”, the severely degraded alpine meadow on the Qinghai-Tibetan Plateau (QTP). However, few researchers have documented the resilience of the revegetated grasslands along the succession gradients. In this study, we surveyed the revegetated grasslands on the QTP at different restoration times: 4-year, 6-year, 9-year, 12-year, 13-year, 14-year, 16-year, 18-year by using chronosequence approach to identify the resilience of the revegetated grasslands from the perspectives of plant and soil quality. We treated “Black Beach” as the baseline for restoration, and non-degraded healthy alpine meadow as the target for the restoration. We used the MDS method to identify the appropriate indicators and created an integrated assessment system that quantified the resilience of plant, soil, plant-soil system of the revegetated grasslands at different recovery years. The results showed that the non-linear resilience of revegetated grasslands were identified for the plant, soil and plant-soil systems along the temporal gradients. The plant resilience of the revegetated grasslands peaked at the 12th recovery year. The soil of the revegetated grasslands was superior to severely degraded grasslands after 13 years of revegetation. Asynchrony existed between the resilience of soil and that of the plant along the temporal gradients. The plant-soil system resilience of the revegetated grasslands peaked at the 16th recovery year. From the perspectives of plant, soil, plant-soil system, the recovery time of severely degraded grassland should be at least 16–18 years to reach a relative stable state. Revegetated grassland can be used as an effective restoration approach to improve the quality and resilience of plant and soil in the severely degraded alpine meadow on the QTP. Abstract: Publication date: Available online 30 December 2018Source: Agriculture, Ecosystems & EnvironmentAuthor(s): Jingjing Li, Chao Yang, Xiaoli Liu, Xinqing Shao The increase in atmospheric nitrogen (N) deposition and precipitation is obvious in the eastern Qinghai–Tibet Plateau. The response of different plant functional groups to increased N deposition and precipitation and the mechanism of N and phosphorus (P) stoichiometry are not yet clear. We examined the effects of the addition of N and water on plant diversity, community productivity and plant N:P stoichiometry of functional groups in an alpine meadow of the Qinghai-Tibet Plateau in China. Our results indicate that N and water additions significantly increased the total above-ground productivity and biomass of grasses in both years but decreased the biomass of forbs in 2018. In addition, plant diversity decreased with a high level of N addition, and the interactions of N and water had a weakening effect on the decline of plant diversity. Plant diversity was negatively correlated with the biomass of grasses. Our results demonstrate that the biomass of grasses showed a negative quadratic relationship with the N:P ratio of grasses, suggesting that addition of N and water shifted the grasses from N-limited to P-limited. The biomass of forbs showed significant positive correlations with the N:P ratio of forbs, implying the forbs still remained N limited. Overall, our study suggests that the response of grasses and forbs to water and N additions is inconsistent from the perspective of plant N:P stoichiometry.